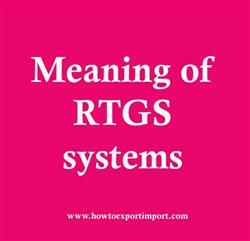 The details about RTGS systems are explained here. Real-time gross settlement are specialist funds transfer systems where the transfer of money or securities. Takes place from one bank to another on a "real time" and on a "gross" basis. Settlement in "real time" means a payment transaction is not subjected to any waiting period, with transactions being settled as soon as they are processed. "Gross settlement" means the transaction is settled on one-to-one basis without bundling or netting with any other transaction. "Settlement" means that once processed, payments are final and irrevocable. RTGS systems are typically used for high-value transactions that require and receive immediate clearing. In some countries the RTGS systems may be the only way to get same day cleared funds and so may be used when payments need to be settled urgently. However, most regular payments would not use a RTGS system, but instead would use a national payment system or network that allows participants to batch and net payments. RTGS system does not require any physical exchange of money; the central bank makes adjustments in the electronic accounts of Bank A and Bank B, reducing the balance in Bank A's account by the amount in question and increasing the balance of Bank B's account by the same amount. The RTGS system is suited for low-volume, high-value transactions. It lowers settlement risk, besides giving an accurate picture of an institution's account at any point of time. The objective of RTGS systems by central banks throughout the world is to minimize risk in high-value electronic payment settlement systems. In an RTGS system, transactions are settled across accounts held at a central bank on a continuous gross basis. Settlement is immediate, final and irrevocable. Credit risks due to settlement lags are eliminated. The best RTGS national payment system cover up to 95% of high-value transactions within the national monetary market. RTGS systems are an alternative to systems of settling transactions at the end of the day, also known as the net settlement system, such as the BACS system in the United Kingdom. In a net settlement system, all the inter-institution transactions during the day are accumulated, and at the end of the day, the central bank adjusts the accounts of the institutions by the net amounts of these transactions. The World Bank has been paying increasing attention to payment system development as a key component of the financial infrastructure of a country, and has provided various forms of assistance to over 100 countries. Most of the RTGS systems in place are secure and have been designed around international standards and best practices. There are several reasons for central banks to adopt RTGS. First, a decision to adopt is influenced by competitive pressure from the global financial markets. Second, it is more beneficial to adopt an RTGS system for central bank when this allows access to a broad system of other countries' RTGS systems. Third, it is very likely that the knowledge acquired through experiences with RTGS systems spills over to other central banks and helps them make their adoption decision. Fourth, central banks do not necessarily have to install and develop RTGS themselves. The possibility of sharing development with providers that have built RTGS systems in more than one country (CGI of UK, CMA Small System of Sweden, JV Pergo of South Africa and SIA SpA of Italy, Montran of USA) has presumably lowered the cost and hence made it feasible for many countries to adopt. As at 1985, three central banks had implemented RTGS systems, while by the end of 2005, RTGS systems had been implemented by 90 central banks. This post describes about RTGS systems. Comment below your thoughts about this post RTGS systems. How to import to India from Slovak?